PULLMAN, Wash. – Creating a national model to connect graduate education in the humanities to rural and underserved populations is the aim of a new Washington State University effort being funded by the National Endowment for the Humanities. The $18,000 NEH matching grant will initiate a year of discussion and planning at WSU, and is funded through the NEH’s NextGen Ph.D. program. The interdisciplinary initiative will bring together more than 20 faculty, staff, graduate students and recent graduate alumni from across WSU. The group will consider how graduate education in the humanities can better support the university’s land-grant mission of improving access, inclusivity and democratic engagement. Titled “Reimagining the 21st-Century Land Grant Ph.D.,” the initiative is supported by traditional stakeholders in graduate education along with new partners who will help extend the university’s reach and commitment to the humanities, said Todd Butler, chair of the English department and principal investigator for the grant. Participating in the effort will be the WSU Graduate School, the College of Arts and Sciences, the departments of English; history; foreign languages and cultures; and critical, culture, gender and race studies; and leaders from the Center for Digital Scholarship and Curation; the Elson S. Floyd School of Medicine’s iREACH program; the Plateau Center for Research and Collaboration; the Office of Research; and WSU Extension. Such diversity in participants will be crucial to the initiative’s success, Butler said. This focus on diversity extends to the individuals involved in the grant: half of the participating graduate students are members of diverse communities, and the participating alumni — which include a farm manager, a National Park historian, and a secondary school teacher — all reside in small towns in Washington, Idaho and Oregon. History graduate student Ryan Booth, an enrolled member of the Upper Skagit Tribe, sees such varied experience as key to the group’s efforts. Encouraging a reengagement with small communities and public lands. How to best use emerging technologies to advance such efforts. Identifying policy and program changes that can help support WSU graduate students in pursuing more publicly engaged research and scholarship. In addition, WSU’s NextGen team hopes to conduct multiple site visits to begin developing active connections between the humanities and community partners. Operating in parallel with a similar focus at WSU’s new School of Medicine, one aim of these partnerships will be to encourage graduate students to consider the widest possible range of communities and people where their future work could be valuable. 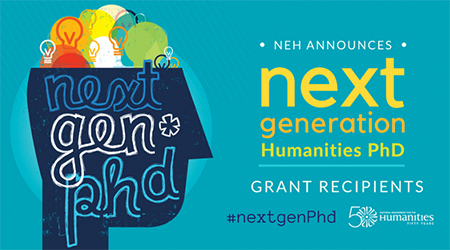 The NEH, one of the largest funders of humanities programs in the United States, created the NextGen Ph.D. program in 2016 to support efforts to transform scholarly preparation in the humanities at the doctoral level and to incorporate broader career preparation for doctoral degree candidates. Along with Syracuse University, West Virginia University, and the University of Pittsburgh, WSU was one of only four higher education institutions nationwide to receive a 2018 NextGen grant.